Owl descends their dismal sound upon us all the way from Germany. This is their fifth release and it just crushed my life in less than fifteen minutes. Now that’s pretty quick for total soul destruction. Although when done just right, there is no need for a twenty minute opus. Not saying that long songs aren’t amazing now. But there is something to be said that can convey a feeling in less than a few minutes. Track one starts off with a dissonant intro. Owl reminds me of Strapping Young Lad with the crushing simplicity and Meshuggah with the off time sections. Awesome how there are clean vocals over such heavy music. Track two has more harsh vocals but also more melody with the string section. It’s nice to hear what break downs used to sound like before the invisible ninjas started emerging in the mosh pits. Good old fashion heavy palm muting. At times I’m strongly reminded of “Catch 22” by Meshuggah. They’re able to transition the beat from being a straight groove to of time and then back seamlessly. This is one of the greatest attributes Owl has that makes them stand out from the rest. “Aeon Cult”, is short, sweet and to the point. Everything I could ask for from a doom album is right here in three songs. I love long songs especially getting into metal from listening to Opeth. Although sometimes people don’t have the free time to even finish one track off a doom album cause their ten to twenty minutes long. 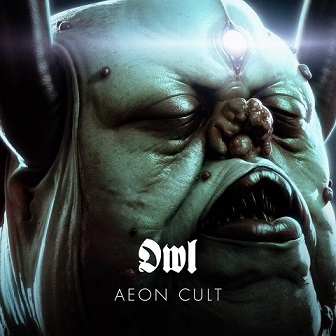 Owl unites old school doom vocals with a modern sound that will utterly obliterate your skull with every single riff. Owl achieves some of the best tone I’ve ever heard. So crisp, so clean yet concrete shattering at the same time.